| Fantasy Footy Forfeit Battle Week #11 | #TeamAFTV Enter the League: http://bit.ly/AFTVFBL SUBSCRIBE HERE: https://goo.gl/Zq9NcA AFTV ONLINE SHOP : http://goo.gl/rin8oW AFTV APP: IPHONE : http://goo.gl/1TNrv0 AFTV APP: ANDROID: http://goo.gl/uV0jFB AFTV WEBSITE: http://goo.gl/7P72Ti AFTV TWITTER: http://goo.gl/SNZXih AFTV FACEBOOK: http://goo.gl/V9E5Ec AFTV INSTAGRAM: http://goo.gl/dbg8Ur Arsenal Fan TV is the fastest growing Arsenal FC Youtube Channel covering everything Arsenal. The Aftermath Show | Can We Get 2nd Or Even 1st? Join The Mondo Goal Weekly Fantasy League Here Now and win prizes.http://tinyurl.com/ms6b757 The Aftermath Show | Can We Get 2nd Or Even 1st? 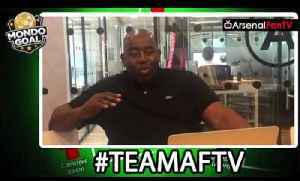 AFTV ONLINE SHOP : http://goo.gl/rin8oW AFTV APP:..
ROBBIE'S REVENGE!!! | Ultimate Mondo Goal Forfeit It's Robbie's turn to choose the Mondo Goal Forfeit and things are about to get HOT!!! SUBSCRIBE HERE: https://goo.gl/Zq9NcA AFTV ONLINE SHOP..
Time To Make A Come Back | Mondo Goal Forfeit Challenge SUBSCRIBE HERE: https://goo.gl/Zq9NcA AFTV ONLINE SHOP : http://goo.gl/rin8oW AFTV APP: IPHONE : http://goo.gl/1TNrv0 AFTV APP: ANDROID:.. The Aftermath | The New Boys Steal The Show !!! The Aftermath | The New Boys Steal The Show !!! A review of the big win over Everton with the Fans tweets. Sponsored by Mondo Goal. Mondogoal Fantasy Football: http://goo.gl/W9iu2w AFTV ONLINE..
"Alexis Sanchez Baby" | New Chant for Arsenal Hero Join The Mondo Goal Weekly Fantasy League Here Now: http://tinyurl.com/ms6b757 AFTV ONLINE SHOP : http://goo.gl/rin8oW AFTV APP: IPHONE :..
100 Million To Spend | Can You Beat Robbie's Team?? Mondogoal Fantasy Football: Join The Mondo Goal Weekly Fantasy League Here Now: http://tinyurl.com/ms6b757 AFTV ONLINE SHOP : http://goo.gl/rin8oW AFTV APP: IPHONE : http://goo.gl/1TNrv0 AFTV APP:..